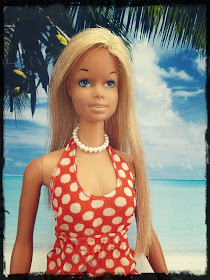 MiShel Designs: Being a Little Knotty! Last week I mentioned how Pattye over at Patricia Saab Designs on Etsy was nice enough to send me some Beader's Secret Thread to try out and I managed to sneak in a little "Knotty-Time" this weekend and wanted to give you all an update. Click here to read the post from last week where I showed you the samples she sent and the photo of all the beautiful colors of Beader's Secret thread she offers in her shop. Pattye sent along a couple of large eye needles for me too, since this nylon cord works best for knotting pearls when it's doubled over. 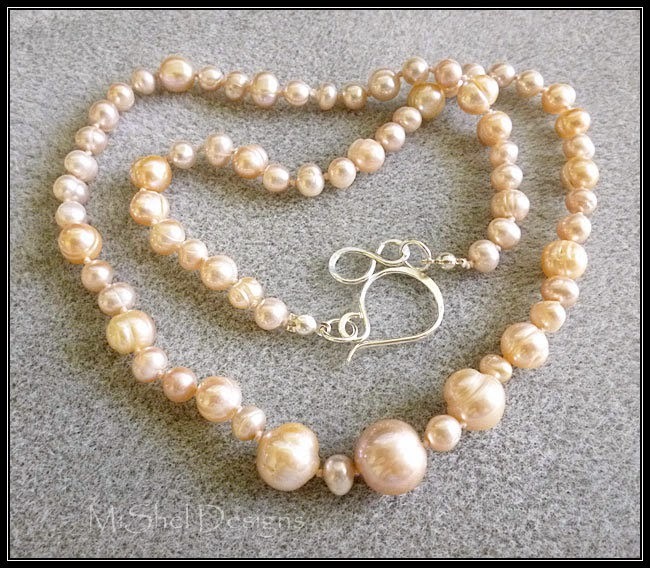 With the exception of the three larger pearls in the front of the necklace, I went with a rather 'random' pattern here because,...well, basically because they were mostly mismatched pearls from various strands I've used through the years. Orphans, if you will. LOL!! And, the 'Shell' color of the Beader's Secret cord matched up perfectly, so I just went with it. 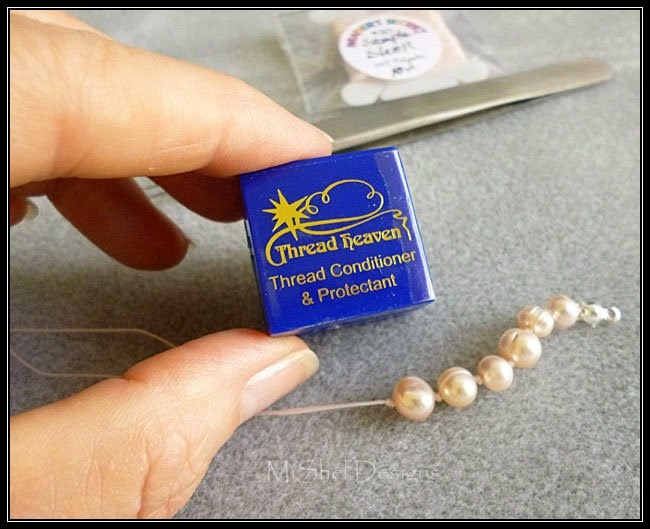 When I work with thread that's doubled over, I like to condition it with a product like Thread Heaven because it makes it a bit more manageable for me. I decided to do a simple, 17 inch hand knotted necklace using my tweezers. Half way through the process I converted to knotting with out tweezers. Or tool-less. 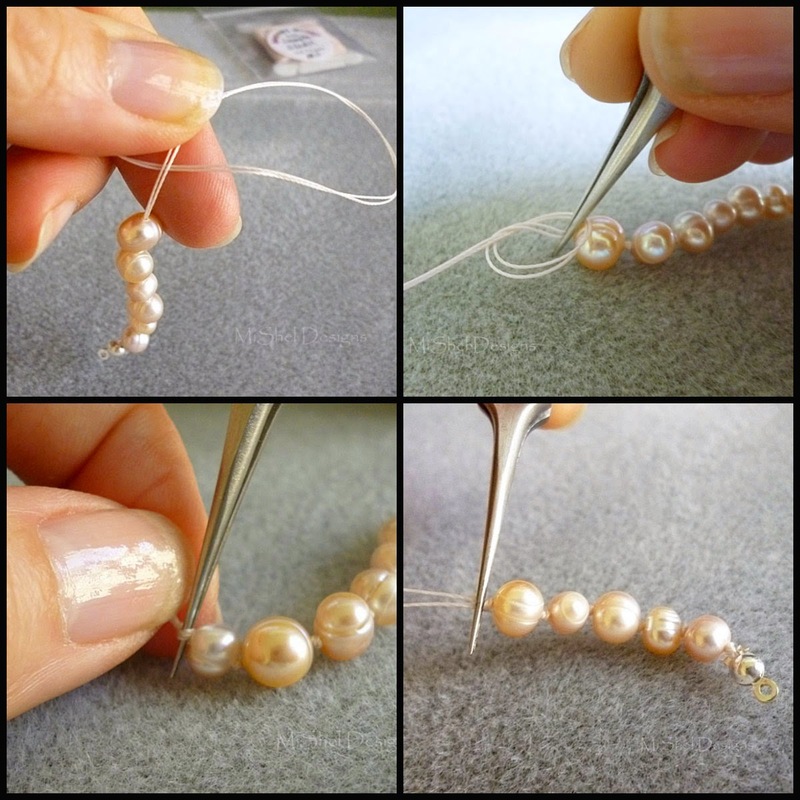 I didn't get any photos of that process, but here's a great video from 'Pearlmaven' over on You Tube that shows you exactly how I knotted the remaining strand. I actually do it 'mirrored' to the way she does it. 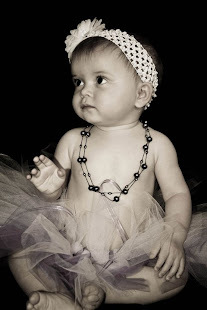 So, holding the pearls with my right hand and letting my left hand do the other 'stuff'. You'll see what I mean when you watch the video. 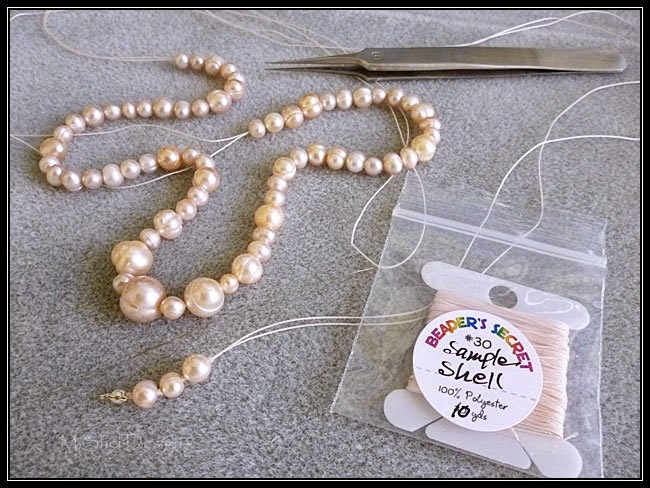 The Beader's Secret thread was easy to 'stretch' prior to stringing my pearls on the cord to be knotted and it didn't seem to kink up or twist as much as other nylon cords (SuperLon or C-Lon) I use. I really liked the way the Beader's Secret thread knotted, too. It was soft and very supple, just like silk, and made neat, little knots. 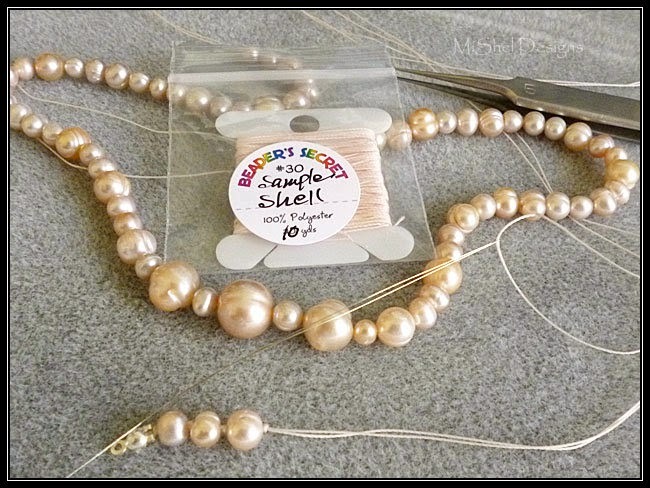 I can see myself suggesting this as an alternative to silk for my clients who wish me to restring their vintage or family heirloom pearls. 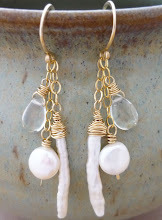 So, overall, I'd have to say that for traditional knotting, it's a winner! Thanks again Pattye for introducing me to Beader's Secret, I like it! Peace, Love and New Knotty Fun! *And no, Pattye didn't pay me to write this review or anything like that. If you read the post I where I mentioned all this last week, you'll know that I convo'd her over on Etsy with about a dozen questions and she just said, "Here Shelly, let me send you a sample and you can see for yourself!" Great customer service, wouldn't you say?!! I am definitely going to have to give it a try since I prefer using the double strands. 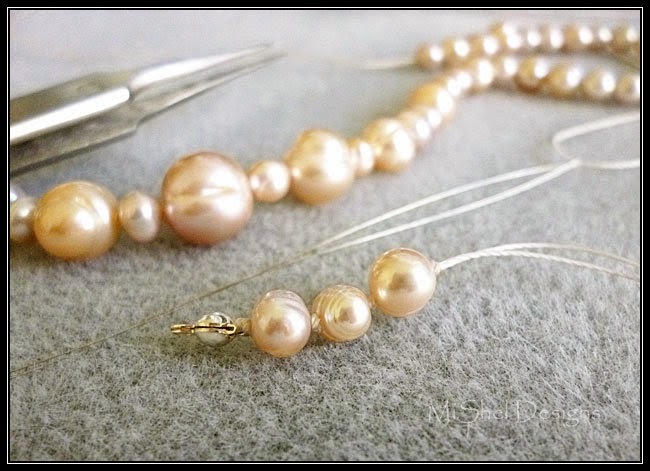 And I will admit that I can't stand using the tweezers when I am knotting. 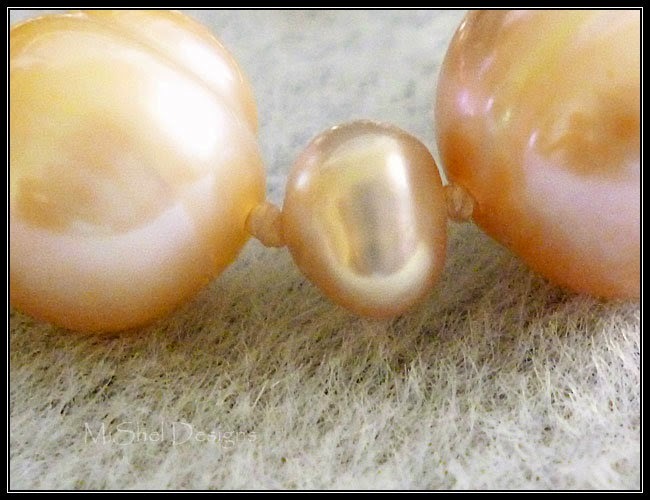 They just seem to get in my way and my knots never seem to end up snugged up to the pearl. Shaiha, if you watch the video link in my post above, she does a really great job going slow and showing you how to do the 'no tool' way to knot. I had to modify it a bit, as my hands just didn't want to do exactly what she was doing, and for some reason, I felt more comfortable doing it 'opposite' as she did. I'm ambidextrous, so maybe that has something to do with it, but I've really trained myself to do most jewelry things right-handed, especially since I teach students who are mostly right-handed. And if you ever have questions about knotting or anything like that - just shoot me an email and I'll do my best to help out and answer your questions! beautiful and simple and elegant - love it Shel!